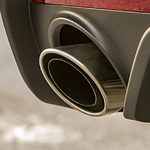 The new exhaust system was designed to help with early mornings and the roaring V8 engine. You can now change to four different modes, including quiet, normal, stop, and track settings. The quiet start mode allows you to avoid the roar in the morning, and you can schedule it to start at the same time every day. It's time to get into a new Mustang GT. You can also choose track mode when you want to let the engine roar to life. Want to check it out in person? You can head to Lithia Ford of Missoula.